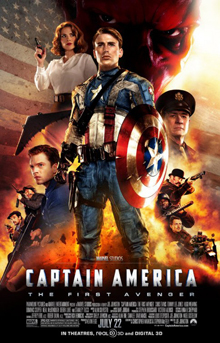 Captain America: The First Avenger tells the Marvel Cinematic Universe-version of the origin story of the Star-Spangled Avenger: Captain America, also known as Steve Rogers (played by Chris Evans). Steve is the most patriotic, good-hearted American around, and he wants nothing more than to just do his part for the American military in World War II. But he is constantly rejected due to health and physical problems. Steve is a small and scrawny young man, and therefore not deemed fit for duty. But, one day, Steve finds himself in the best possible situation. He is selected by the S.S.R. to be a part of a super-soldier experiment. After taking part in the experiment, Steve becomes the iconic hero, and is soon ready to battle Nazi-Germany, Hydra, and the evil Red Skull (played by Hugo Weaving). One of the refreshing things about this film is that while it is another origin story, it isn’t set in present day – and it never looks like the typical superhero film. The refreshing nature of The First Avenger is perfectly shown halfway through the film, as Steve decides to help his country in a different way. We cut to Steve being the poster boy for patriotism and war bonds, as well as a symbol of escapism during World War II. The Star-Spangled Man with a Plan-montage is a delight, and its abrupt ending is perfect for this type of film. Also, this story is just filled with so much want and so much hope, in spite of its ending. Captain America is a man of the people, and he isn’t born of tragedy. He is a symbol of hope and patriotism. And somehow Marvel Studios just got the perfect man to play the part. Chris Evans was perfectly familiar with the world of comic books and superheroes. Prior to playing Steve Rogers, he had voiced Casey Jones in 2007’s TMNT, played Johnny Storm twice in 20th Century Fox’s Fantastic Four-franchise, played one of the evil exes in Scott Pilgrim vs. The World, and played Jake Jensen in 2010’s The Losers. Chris Evans had quite the resume when he agreed to become Captain America. Evans had tested himself in similar films, and was ready to play one of the most important heroes in Marvel Comics history. And Chris Evans did an awesome job. Just like Christopher Reeve just is Superman, and Robert Downey, Jr. is Iron Man – Chris Evans is the perfect Steve Rogers. “Yeah, I’ve Knocked Out Adolf Hitler Over 200 Times.” – Steve Rogers. You can definitely see why so many people, including myself, came to love this character. One of the things that bothered me a little bit, though, was how artificial Steve Rogers looked prior to going through the super-soldier experiment. I understand that it couldn’t really be helped, but it really doesn’t look well. One of the great things about The First Avenger is the fact that the writers managed to make us care about two relationships that would end up becoming central to the Marvel Cinematic Universe. The friendship between Steve and Bucky (played by Sebastian Stan) is really handled well, and would lead to something even greater to this film’s sequel. Steve’s relationship with Peggy Carter (played by Hayley Atwell) was even greater. There are some really good moments between these characters here, and both Stan and Atwell give solid and memorable performances. Also, Marvel Studios hasn’t always given us the best villains, but I do think Red Skull was a pretty good one. All in all, while Captain America: The First Avenger may not be a groundbreaking superhero film, it is one of the most refreshing films in the genre we’ve ever had. It is a very special film, featuring iconic performances and a unique setting. Captain America: The First Avenger is a great comic book film.